Our Relish Collection honors our favorite vintage storage icon - reusable jars. This vessel is no longer just grandma's go-to, but a favorite for home décor, craters and Makers. Filled with delicious fragrance and offered in 7 striking colors. Now offered in vintage bottle diffusers as well. Up cycle Paddywax Relish jars and bottles to store all of life's treasures. 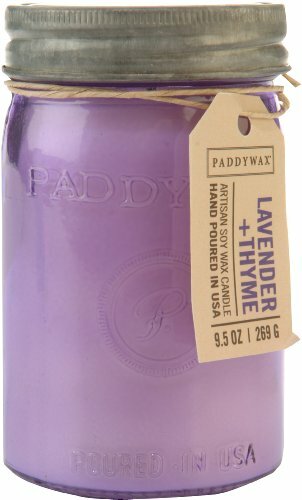 Paddywax, an artisan candle company, is known for its innovative fragrances and fresh style. All of our Candles are proudly made in the U.S.A. Every candle is hand treated from start to finish, giving each piece a personal touch. Paddywax boasts a variety of candle collections satisfying any candle need from décor to gifting to just indulgence and is not that what candles are really about? The process of making Paddywax candles is artisan in every sense, closely resembling techniques used to make candles hundreds of years ago. From fragrance throw to burn time, each custom recipe is made to deliver the best experience. Our fragrance blends are developed to distribute the most natural aroma through the use of all natural ingredients. We take pride in never offering a synthetic fragrance; instead we constantly push ourselves to create something natural and unique. It begins when every candle is hand poured and ends when each product is packaged with precision. Each bow and label are applied by hand to give every product that human touch that is worthy of gift giving. We take pride in our work and know that every detail counts.